Objective: Many hospitals are investing in computer-based provider order-entry (POE) systems, and providers’ evaluations have proved important for the success of the systems. The authors assessed how physicians and nurses viewed the effects of one modified commercial POE system on time spent patients, resource utilization, errors with orders, and overall quality of care. Design: Survey. Measurements: Opinions of 271 POE users on medicine wards of an urban teaching hospital: 96 medical house officers, 49 attending physicians, 19 clinical fellows with heavy inpatient loads, and 107 nurses. Results: Responses were received from 85 percent of the sample. Most physicians and nurses agreed that orders were executed faster under POE. About 30 percent of house officers and attendings or fellows, compared with 56 percent of nurses, reported improvement in overall quality of care with POE. Forty-four percent of house officers and 34 percent of attendings/fellows reported that their time with patients decreased, whereas 56 percent of nurses indicated that their time with patients increased (P < 0.001). Sixty percent of house officers and 41 percent of attendings/fellows indicated that order errors increased, whereas 69 percent of nurses indicated a decrease or no change in errors. Although most nurses reported no change in the frequency of ordering tests and medications with POE, 61 percent of house officers reported an increased frequency. 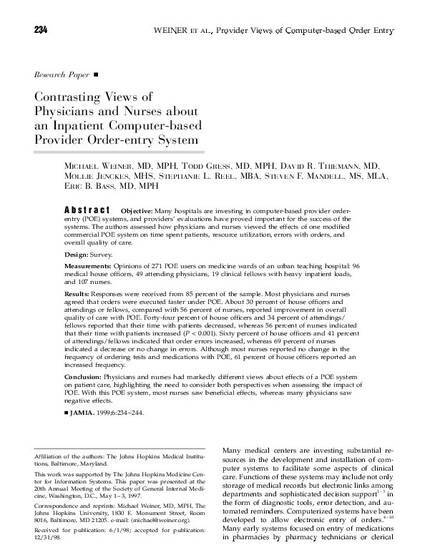 Conclusion: Physicians and nurses had markedly different views about effects of a POE system on patient care, highlighting the need to consider both perspectives when assessing the impact of POE. With this POE system, most nurses saw beneficial effects, whereas many physicians saw negative effects. Weiner M, Gress T, Thieman DR, Reel SL, Mandel SF, Bass EB. Contrasting views of physicians and nurses about computerized physician order entry. Journal of the American Informatics Association 1999;6:234-44.